As Turks debate an upcoming referendum that would modify the country’s constitution, a recent Pew Global Attitudes survey reveals how much confidence in Turkish institutions has slipped over the last few years. The referendum, which is backed by the ruling religiously-oriented Justice and Development Party (AKP) and opposed by more secular opposition groups, includes provisions regarding the judiciary, as well as measures that would increase civilian control of the military. Throughout the country’s history, the military has a played a major role in Turkish politics, and it continues to be a popular institution: 72% say it is having a very or somewhat good influence on the way things are going in Turkey. However, this is down from 85% in 2007. And the number of Turks who believe the military is having a very good impact has declined from 57% to 30% over this period. Confidence in the military has dropped most steeply among the nation’s Kurdish population – just 37% of Kurds give the military a positive rating, compared with 64% in the 2007 poll. Among the institutions and leaders tested on the poll, which was conducted April 12-30, the police receive the second highest ratings, with 68% of Turks saying the police are having a good influence on the way things are going. The police receive especially favorable ratings from AKP supporters (84% good). Relatively few Kurds (39% good) offer a positive assessment. Prime Minister Recep Tayyip Erdogan’s ratings have slipped over the last three years. Currently, 52% say he is having a good impact and 43% say he is having a bad impact, while in 2007 63% described his impact as good and 33% as bad. Unsurprisingly, Erdogan gets his highest marks from supporters of his own AKP, 90% of whom think he is having a positive effect. The prime minister receives especially strong ratings in the Central Anatolia region of the country (71% good), which is a stronghold of the AKP. Views about Erdogan are also correlated with religiosity. Two-thirds (67%) of Muslim Turks who pray five times a day assign the prime minister a positive rating. Among those who pray at least once a week but less than five times daily, views are essentially split (51% good, 47% bad). And among those who hardly ever pray or only do so during religious holidays, just 36% say Erdogan is having good impact. Although Erdogan’s ratings have declined since 2007, he still gets considerably better marks than former Prime Minister Bulent Ecevit received in 2002 – at the time only, 7% of Turks felt he was having a good influence on the country. 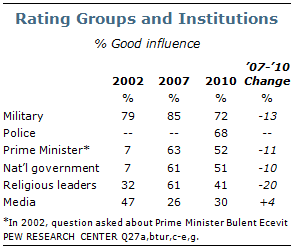 Views about the national government are very similar to views about Prime Minister Erdogan. Roughly half (51%) think the national government is having a positive impact, down from 61% three years ago. And the national government gets its best reviews among AKP supporters, residents of Central Anatolia, and Muslims who pray frequently. Ratings for religious leaders have declined substantially since 2007 – 41% believe they are having a positive influence, a decline of 20 percentage points from three years ago. Muslims who pray five times daily (56% good) give religious leaders higher ratings than do those who pray at least once a week but less than five times a day (37%) and those who rarely pray (24%). AKP supporters (63% good) and residents of Central Anatolia (61%) also believe religious leaders are having a positive effect in Turkey. The media receive the lowest ratings among the institutions tested: only 30% of Turks think the media is having a positive effect on society. In recent years, the image of the United States has been largely negative in Turkey. In fact, Turkey was the country in which the U.S. received its lowest favorability rating in every Pew Global Attitudes survey conducted between 2006 and 2009. This year, just 17% of Turks have a positive opinion of the U.S., tying Turkey with Pakistan and Egypt for the lowest U.S. favorability rating among the 22 nations surveyed. 1 Still, the number of Turks who hold a positive view of the U.S. is larger today than it was at its nadir in 2007, when only 9% rated the U.S. favorably. The U.S. is not alone in receiving negative reviews in Turkey. Ratings for other countries and organizations are also low, and in many cases are lower today than they were a few years ago. For instance, as negotiations regarding Turkey’s bid for membership in the European Union have stalled, attitudes toward the EU have deteriorated. In 2004, 58% of Turks held a favorable opinion of the EU, however, by 2009 this number had plummeted to 22%. Views of the EU have improved slightly over the last year – currently, 28% rate the organization favorably. Support for joining the EU has also declined: in 2005, 68% of Turks wanted their country to become an EU member; today, a slim 54% majority holds this view. The Kurdish minority is much more pro-European than the rest of the population. About half (49%) express a favorable opinion of the EU and eight-in-ten favor EU membership for Turkey. Ratings for Iran and China have also tumbled in recent years. In 2006, when the Pew Global Attitudes Project first asked about Iran, 53% of Turks expressed a positive opinion; today, just with 26% hold this view. 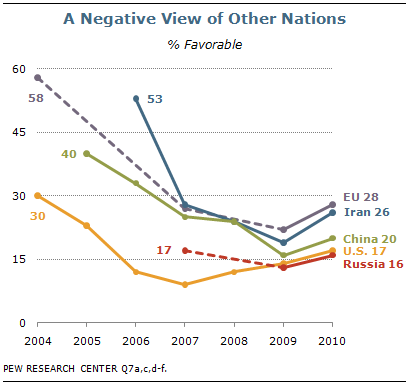 In 2005, 40% expressed a favorable opinion of China, compared with 20% now. However, as is the case with the EU, ratings for both Iran and China did improve marginally between 2009 and 2010. Attitudes toward Russia have remained consistently low over the last three years – 17% of Turks said they had a positive view of Russia in 2007 and 16% express this view in the 2010 survey. While Turks express largely negative opinions about other countries, they also tend to believe the feeling is mutual. When asked how they think people in other nations around the world feel about Turkey, 68% of Turks say they think their country is generally disliked, the highest percentage among the 22 countries surveyed. The only other nation in which a majority believes their country is unpopular abroad is the U.S. – 60% of Americans think the U.S. is generally disliked by others around the globe. The table provides details about the survey’s methodology, including the margin of sampling error based on all interviews conducted in Turkey. For the results based on the full sample, one can say with 95% confidence that the error attributable to sampling and other random effects is plus or minus the margin of error. In addition to sampling error, one should bear in mind that question wording and practical difficulties in conducting surveys can introduce error or bias into the findings of opinion polls.